To grow food by yourself — already half-forgotten, but very incomparable pleasure. In the time of the global warming, we risk losing our favorite vegetables, fruits, salads, herbs and other things. To prepare for the fact that the U.S. government will not be able to provide food for its citizens, we have decided to figure out how to provide us food and all necessary to subsistence farming in the apartment. If you do not have a suburban area, extra time and a suitable climate it does not mean that you cannot grow vegetables, fruits, salads, mushrooms, and even edible insects. By the way, in the book “Food for Freedom” is detaily described how to provide to the family food from the scratch. 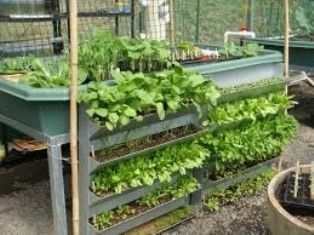 Using this simple tips you can quickly grow herbs, fruits and vegetables yourself unaided. I strongly recommend this book to all who care about their future. In the meantime, I would like to share several new products in the area of farming in the apartment. „Grow Your Own Pizza” will help you to survive under sanctions and to use only the freshest ingredients in your Italian dishes without messing around and bustle. Just put three already prepared pots in a sunny place and water them. After some time, you will have the main ingredients for pizza: tomatoes, peppers and basil, grown with your own hands. “Woolly Pocket” —this device is capable of creating “eternal springtime” in the space of your own home. The area of our apartments does not allow to organize a full-fledged greenhouse, but the problem is solved with the modular suspended pockets; they are turning interior walls into hanging gardens. Woolly Pocket is well ventilated, but will not let the water go out of pockets. Material from which they are made is created from recycled plastic bottles. “Auxano” – a hydroponic system specifically designed for city dwellers who want to grow vegetables and fruits in a limited space. Auxano – a practical solution, which is installed directly on the window frame on the inside and allowing the plants to have access to sunlight and turns unused space into a vertical garden. Built-in Oxygenating supports help water circulation without being connected to the electricity source. “Click and Grow” — another simple system for growing tomatoes, peppers, salads, basil, coriander and other plants at home. Smart electric pot saves the owners from having to water and feed the plants. It is enough to activate the built-in cartridge, and Click & Grow will automatically measure the required parameters and will give plants right amount of water, fertilizer and air, depending on their needs. Company from Palo – Alto attracted on Kickstarter required amount of the money for the launch of its second device – Smart Herb Garden. The new model is characterized by the presence of LED-backlighting. Insects are an excellent source of protein, and soon they have a chance to be part of our diet. The UN a couple of years ago came with a report in which the use of insects as food is called the real way to fight the hunger in the world. Nowadays everyone has a chance to taste the food of the future. “Open Source Bug Farm Kit” developed by Tiny Farms, allows you to create a personal farm with everything you need to start to grow edible flour beetle larvae at home.